Ivana Popović Martinović is taking part in Montevizija for the second year in a row. 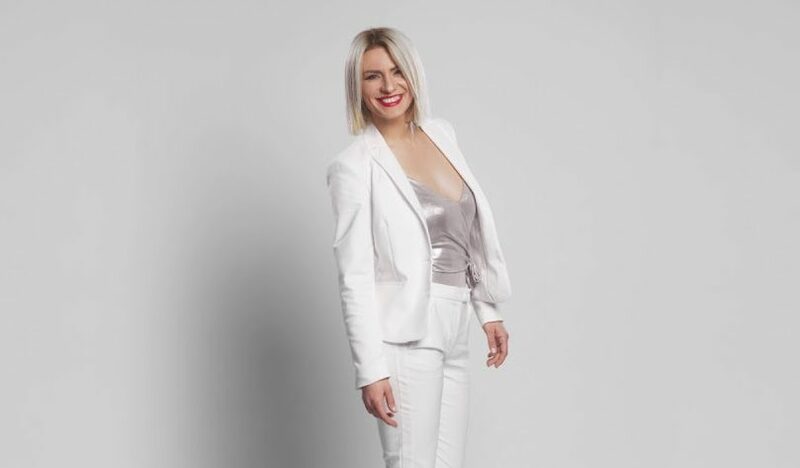 After placing fourth last year with “Poljupci” which went on to become a hit in Montenegro, Ivana is back again this year, and will try to win Montenegro’s ticket to the Eurovision Song Contest in Tel Aviv with the song “Nevinost”. Hi Ivana! Thank you for taking your time out for doing this interview with us. For the start, tell us how was your experience in last year’s Montevizija? Last year’s Montevizija was a true refreshment for us performers, as well as for composers. The five of us who competed, we experienced a completely fair approach from the organizers – the same sort of promotion for each and every one of us contestants, as well as the positive attitude of the staff. There was no favoritism, and everyone approached Montevizija with such enthusiasm and will to bring this competition back to its feet. How did you decide to enter the competition once again this year? In the begining of October I released the video clip for my last year’s entry “Poljupci”. In a way, I was still ‘warmed up’ to the whole Montevizija story and its atmosphere, and then the new call for songs was released. I had two strong reasons to apply – the first one was to raise my work atmosphere because I had a really good song for this show, and apart from this one, I was working on two other songs as well. On the other hand, I believe that we should all create more in our country, and that we should show our own creations in the right way, because this would inspire even more people. I am always up for supporting these sorts of events, because if you have a good song, you need to show that the local strength and talent should not be underestimated. Who’s the team behind this entry? The team who worked on “Nevinost” is basically the same as the team behind “Poljupci” last year. The difference is that this time I wrote the lyrics, while last year the lyricist was my husband Ljubiša. The song was once again composed by Slavko Milovanović, my very good friend and a very talented composer, while Vladan Popović Pop and Marko Milatović – the best team in my opinion, did the arrangement. How would you compare “Nevinost” to “Poljupci”? “Nevinost” is a much more Eurovision-friendly song, in comparison to “Poljupci” which was not intended for that type of event. Consequently, every segment of the song has been inspired by this Eurovision atmosphere – starting from its energy, its theme, and of course, my styling and preparations for the performance itself. It is very inspiring when something in music is targeted and intended. But the most important thing for me is that honesty has to remain at the highest level, because it is set right there from the very beginning. Also, “Nevinost” is not a club song, it’s also not a love song, but it is still very powerful and emotional. If you had to describe this song in three words, what would those words be? Do you already have some ideas about how your performance in Montevizija is going to look like? Normally as soon as the lyrics are finished, I normally have a clear picture in my head about how something should look like. This time it is even easier, as I was the one who wrote the lyrics, and since I started writing them, I didn’t do a single correction. This is why I have a clear idea and I can picture every single detail about how my performance is going to be. But you’ll just need to wait a few more days and see it then. Who would you say is your biggest competition in this year’s Montevizija? I can’t really say. But judging by the excitement and the whole atmosphere, there’s a generally stronger sense of rivalry with all contestants this year. And I’m honestly happy that this is the case, because this is what can also inspire us and move us to be even better. Why should you be the one to win, and to represent Montenegro in Eurovision in Israel? My instinct says that this year is the right time for me, that my song is great, and that all pieces of the puzzle came together perfectly. And my mind says the same thing. Thus as far as I’m concerned, everyone agrees 😀 Anyways, I believe that this year will be much more adventurous than last year. Whether it’s going to be Tel Aviv, or something more interesting is yet to be seen. If it is Tel Aviv, I am more than ready for it! As you mentioned before, you shot a video clip for “Poljupci”. Can we expect one for “Nevinost” as well? Yes, absolutely, we will shoot a video clip for this song as well. But as I mentioned before, I’m also working on two other songs, and these will also have their own video clips. I really have wonderful and big plans, so Montevizija, and even better Eurovision, would fit in perfectly in this entire story. Tell us more about these other two songs that you are working on. One of the two songs which is now almost finished. It’s called “Iluzija”, and this is something I’m working on with with a very special approach and with a lot of love. I’m writing the lyrics for this song as well, and thus I really want to get the maximum out of it. This song, as well as “Nevinost”, has (as I like to call it) a “very clean-written first and last letter”, with no corrections. I want to enjoy the whole thing, especially when I being the video clip shooting. In the meantime, a sketch of an arrangement for covering a famous old-age song from our region titled “Sendefu majka buđaše“ has also been done. But I will be able to tell you more about this at a later date, because things are easier created in a different sort of peace, not in silence. For this one I need a special type of peace and calm, in order to make it the perfect cover. In our interview last year, you told me that you like to discover new singers and new songs all the time. Did you discover someone new in Eurovision, and then started following their work? The music we hear in Eurovision is something that really goes up-to-date with the music trends in every way. What I normally listen to is completely different to everything I do, but it’s also completely different to Eurovision as well. However, every year I discover someone very special thanks to Eurovision. I still remember fantastic Boaz and his “Keilo Kan” from 2008. His voice is like magic, and I just love hearing it over and over again. Also, Salvador Sobral was one of the most pleasant surprise for me in recent years. His music is included in my playlists, and with such music I cure my own hearing and soul. Thank you very much for your time once again Ivana, and we wish you the best of luck in Montevizija!